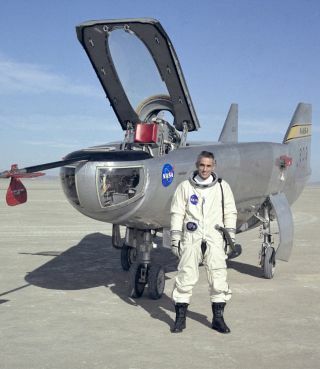 NASA Research pilot John Manke pictured with the M2-F3 lifting body. In this historical photo from the U.S. space agency, NASA research pilot John A. Manke is seen here in January of 1972 in front of the M2-F3 lifting body. Manke was hired by NASA on May 25, 1962, as a flight research engineer. He was later assigned to the pilot's office and flew various support aircraft including the F-104, F-5D, F-111 and C-47. The M2-F3 reached a top speed of l,064 mph (Mach 1.6). Highest altitude reached by the vehicle was 7l,500 feet on December 21, 1972, the date of its last flight with NASA pilot John Manke at the controls. The information the lifting body program generated contributed to the data base that led to development of today's Space Shuttle program. NASA donated The M2-F3 vehicle to the Smithsonian Institution in December 1973.